They arrive on December 30th, just before a historic blizzard seals the lodge off from the outside world. Two days later, on New Year’s Day, one of them is dead. Nine thirty-something friends who’ve known each other for years gather as guests at a remote lodge in the Scottish Highlands to celebrate New Year’s Eve. While their lives have all changed since their university days, their relationships and group dynamics are still handcuffed by their shared history. An unexpected death, suspicious staff members, troubling secrets, and a killer on the loose; Lucy Foley’s fourth novel is quite a swerve from her earlier oeuvre of historical and contemporary love stories. An atmospheric, wintry tale that would likely translate well to screen, the tagline could happily read ‘Agatha Christie meets The Big Chill’. THE HUNTING PARTY blends elements of classic ‘cut off from the outside murder mysteries with a tale of friends whose relationships and ideas of themselves are fracturing. And it does it very well. There’s plenty to like in Foley’s first mystery. The set-up quickly draws readers in, the isolated lodge setting is incredibly evocative and atmospheric, and there’s a really good narrative drive as the viewpoint switches between characters and back and forth in time. It's a quick, compelling read. Beyond the pacing and structure, several interesting issues are touched upon, from the idea of otherwise good people acting badly at times, to stalking, to secrets being held within groups of friends, and how we see ourselves and those we are closest to as we age and the years pass us by. This is a page-turner with a capital P, although there are occasional moments where the ‘author hand’ is a little too obvious or the characters feel more like they’re movable pieces in a game rather than as full-fleshed as they may otherwise be. Having said that, there are lots of interesting characters and the dynamics between the group is particularly fascinating and pretty well drawn by Foley. 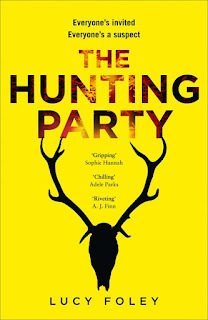 Minor quibbles aside, THE HUNTING PARTY shows that Foley is well-suited to the crime and thriller genre, and hopefully this intriguing and enjoyable read is just the beginning for her.